Boomer at Parkpennies.com has reported new nickel machines at Jolly Trolly Treats (DCA) and the Main Street Opera House exit (DL). In addition, the Finding Dory machine, which was removed from DCA’s Kingswell Camera for a holiday nickel machine, is back. This entry was posted in California, Disney's California Adventure, Disneyland - The Happiest Place on Earth, New machines, Theme Sets & Year Sets on February 16, 2018 by jnmcnally. New penny books for 2018? An Ebay post has a new penny book for Disneyland. I expect Disney World will get a similar design. This entry was posted in Books & accessories, California, Disneyland - The Happiest Place on Earth, Florida on January 3, 2018 by jnmcnally. Presscoins.com is reporting that as of December 27 the new 2018 coins have already been placed at the All Star Resorts and Animal Kingdom. It is expected there will be 15 coins again (8 pennies, 7 quarters) in the same locations, but the quarter machine found in 2017 at the Stage One store (near the Muppets show) is currently unavailable due to construction. Since Disney did a good job with the dated coins in the past, we expect the machine will be moved somewhere else. Meanwhile, in California the holiday nickel sets are on stage at Disneyland and California Adventure, reports Parkpennies.com. 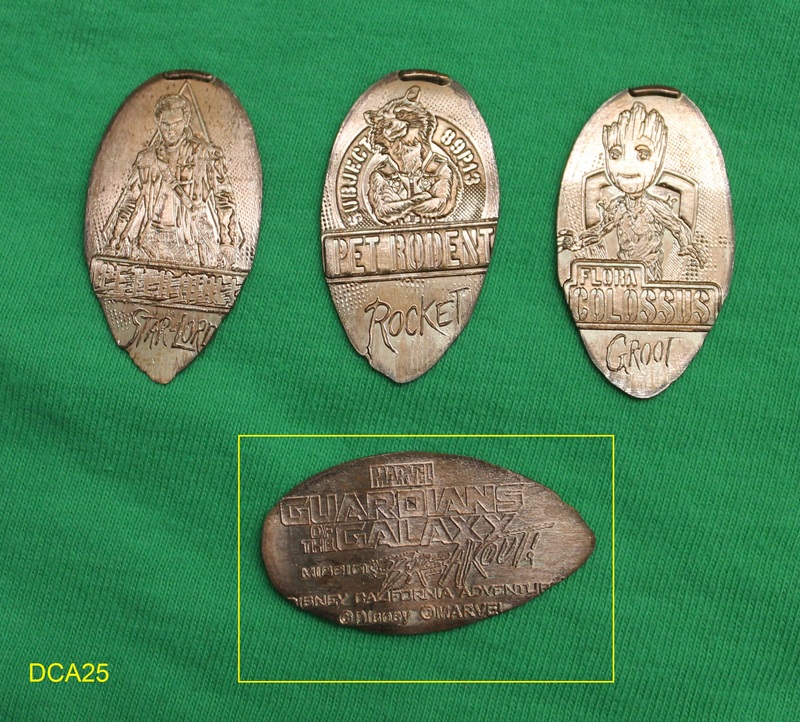 UPDATE: Presscoins.com reports that, as of January 2, three 2018 coins were not yet on-stage: the Grand Floridian 2nd-floor lobby (penny), the Rock Around the Shop store at Rock ‘n’ Roller Coaster (penny), and the quarter machine at Stage 1 Company Store (the “Muppets” store), which is closed off behind a construction wall. This entry was posted in Animal Kingdom, California, Disneyland - The Happiest Place on Earth, Florida, New machines, Resorts/Hotels, Theme Sets & Year Sets on December 27, 2017 by jnmcnally. My sales page has been updated with numerous sets from Disneyland. This includes all the machines that have been installed since the 60th anniversary celebration ended in 2016. All pennies are pressed on pre-1982 copper cents, and quarters are pressed on AU and BU quarters. In addition, there is a selection of designs pressed on foreign coins that are the same size as American coins. This entry was posted in California, Disney's California Adventure, Disneyland - The Happiest Place on Earth, New machines, Tips on July 24, 2017 by jnmcnally. All but one machine from the 60th anniversary series at Disneyland has been replaced by new machines with entirely new designs. The quarter machine that had been placed at the currently-closed Main Street railroad station (and later moved to the Penny Arcade) has been removed but not yet replaced. The new machines include designs devoted to the upcoming (Thanksgiving) Disney movie Moana, Winnie the Pooh, Pirates of the Caribbean, Beauty and the Beast (quarters), Toy Story, Finding Dory, and Indiana Jones. In addition, the non-60th Tiki Room set in Adventureland has been swapped out for a set of coins with Stitch & Angel from the Lilo & Stitch TV series. This means 12 new machines (3 coins each) have been introduced in Anaheim in the past couple months, with one more expected to follow. As always, a reliable up-to-date list of machine locations is found at the ParkPennies website. This entry was posted in California, Disney's California Adventure, Disneyland - The Happiest Place on Earth, Disneyland hotels & Downtown Disney, New machines on October 27, 2016 by jnmcnally. 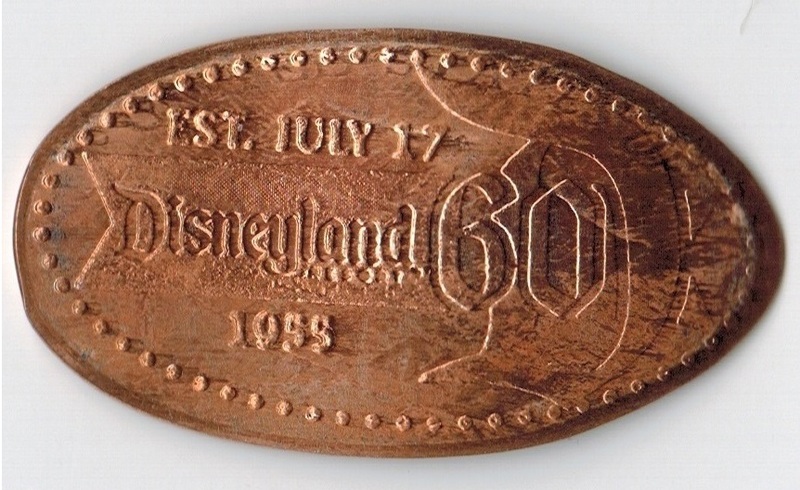 Disneyland had a major pressed coin campaign to celebrate the park’s 60th anniversary – 60 special coins at the parks and World of Disney. That celebration has ended, and the anniversary coins are starting to be replaced. Boomer at www.parkpennies.com reports that the machine at the Pieces of Eight gift shop (Pirates of the Caribbean) is the first spotted change. The good news for collectors: the replacement designs are all-new, and not just a return to the set that was in place before the May 2015 anniversary kickoff. While there is no guarantee that all the 60th machines will get newly-made designs, there is a good chance. This would include two quarter machines and eleven penny presses. As of the end of September, all 60th anniversary machines have been retired. They have been replaced with entirely new designs at World of Disney (2 machines); Rajah’s Mint; Pooh Corner; Enchanted Chamber (quarter machine); and Pirates (as noted in the original article). This entry was posted in California, Disney's California Adventure, Disneyland - The Happiest Place on Earth, Disneyland hotels & Downtown Disney, New machines, Retired/removed, Theme Sets & Year Sets on September 11, 2016 by jnmcnally.